On Tuesday, 26 July Jeff Kennett will announce the winner of the Metro Art Award. 25 artists aged 35 and younger are in the running for the award for painting. I went ahead of the announcement to see the exhibition of the selected paintings. There are plenty of paintings with over blown hyperbole, dramatic images showing-off the painter’s technical skills. There are paintings that are too ordinary or too sentimental. It felt so conservative, all these young artists painting studiously but often without any purpose other than attracting attention. 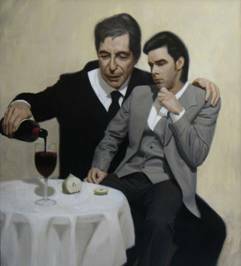 Ben Smith’s “The Influence (Leonard Cohen Consoles Nick Cave)” has odd proportions and in the future, when Cohen and Cave are no longer well known, the painting will just look odd. Vincent Fantauzzo “The Creek” looking like a Caravaggio, with a baroque drama created from working with film director, Baz Luhrmann. 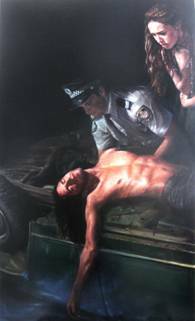 Vincent Fantauzzo would be the favorite having previously won the 2011 Archibald Packing Room Prize winner and Metro Art Award’s People’s Choice Prize Winner in 2009 and 2008. The wild card entry would be Matto Lucas “Daruma” who has painted on a photograph of a painted face. I think that winner might be Michael Brennan “Right Place, Wrong Time” with the intense surface of wrinkled dried paint. Or one of the artists who emerged from Melbourne’s stencil art scene: Luke Cornish (aka E.L.K.) “Untitled, Self Portrait” a multiple layered stencil his legs climbing a ladder, a familiar exercise for artists. In the past I’ve dismissed E.L.K.’s work as technically proficient let down by the content but “Untitled, Self Portrait” combines technique with powerful but restrained image. Or Ben Howe, who was a highly commended emerging artist at the Melbourne Stencil Festival 2009. Howe’s “Time and the Elastic” is an intense, dynamic and unusual image of multiple people in multiple layers. Metro Gallery represents several local and international street artists; a framed Banksy currently hangs in the window by the gallery entrance. “The Metro Art Award previously consisted of a Judges’ Choice Prize of $40,000 and a People’s Choice Prize of $10,000. In 2011, the People’s Choice Prize has been eliminated and the $10,000 has been added to the Judges’ Choice Prize, which is now $50,000.” (Metro’s media release) Dropping the People’s Choice Award is a good move; there are too many of these polls and the results are too easily manipulated. Popular opinion is well represented by the selection panel itself that comprises “the Hon Jeff Kennett AC former Victorian Premier and Arts Minister (Chair); with Fenella Kernebone, Presenter of the ABC TV’s Art Nation Program; the Rev Dr Arthur Bridge AM, founder of Ars Musica Australis, a charitable foundation supporting the creative arts; and human rights advocate Julian Burnside AO QC”. See my review of Metro Art Award 2009. P.S. The Metro Art Award 2011 was won by Vincent Fantauzzo with “The Creek” – I told you he was the favorite to win.